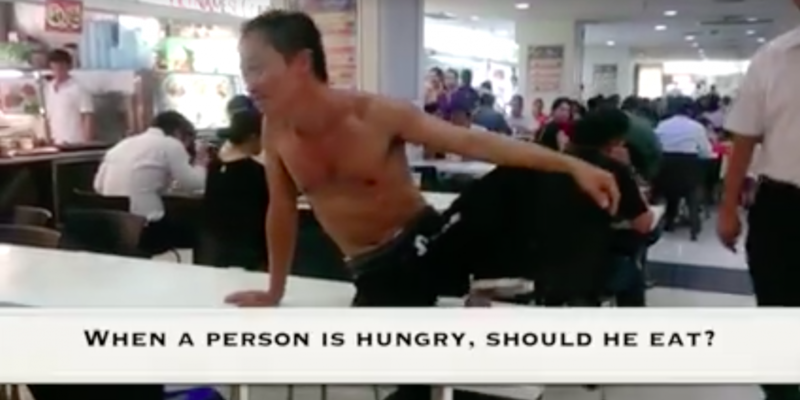 In a rather bizarre but poignant incident in Sim Lim Square, a man called “Little Mouse” made a scene when he took off his shirt and began speaking loudly to all the patrons eating in the food court. The video, posted by Facebook user Douglas Chen, shows a man in a light teal shirt, jogging pants and a man-bun clearing a table of leftovers and looking at the camera. He then proceeds to take off his shirt and pose on the table, and starts to speak loudly, raising various questions to the people inside Sim Lim Square. After taking off his shirt and posing on the table, he starts to question society and why people who are hungry have to pay for food in a place filled with food. At some point a security guard comes over to tell him to calm down, but he continues to say he isn’t bothering anyone. In the end, the security guard paid for a meal for Little Mouse, and you could see the smile on the latter’s face. As of publishing, the video has been viewed more than 460,000 times and has been shared over 6000 times as well. The person who posted the video, Douglas Chan, is a digital marketing professional who gives seminars on sales and marketing to various firms. Some say that this is performance art, and could be part of a project because of a few reasons, which do make sense. Other netizens chose to speculate on his identity. They also noticed that his expressions could reveal his goal of getting a free meal in the end. Related Post: Why would an infant care assistant in Singapore want to be an ISIS bride? Some were just mad and wanted him arrested. While other Singaporeans detested his actions no matter what reason he had. A good thing to note was that some people recognized the kind security guard who bought “Little Mouse” a meal. If you’re ever in Sim Lim, watch out for him. This user said that he knew “Little Mouse,” and tagged the person in the video as a street performer. This person called him smart and gave props to Simon, the security officer. Still, the lingering thoughts that the whole encounter was scripted came to light. Some users wanted to get into a philosophical discussion. This commenter then treated the incident as art, and critiqued it accordingly. Was his goal a free meal all along? Or was he sticking it to The Man? From the way the video was framed, you could see that someone took the time to record and edit in some subtitles, that there was a purpose to this video. Little Mouse’s words seemed rehearsed but well thought-out, and he made good points, criticizing how in a place full of food someone could starve. With the way he acted in the end, when the security guard bought him a meal, though, his smile could mean was that he was supposed to perform something poignant enough to get someone to buy him a meal. But from what we saw, the security guard just felt sorry for him and was a really kind person. What do you think? Was this art? A protest? Or someone who was hungry enough to do all this?